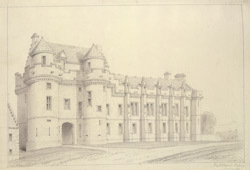 James IV and James V built Falkland Palace between 1501 and 1541 on a site where previous royal residences had stood since the 12th century. The land surrounding the palace offered ample opportunity for hunting deer and wild boar, and this was one reason why the palace was a popular country residence for Stuart monarchs. When James VI (son of Mary Queen of Scots) became James I of England (because Elizabeth I died without her own heir), he brought his court down with him to London from Scotland and gradually the palace fell into disrepair. In 1887 the third Marquess of Bute took over the property and set about restoring it. It is now in the hands of the National Trust of Scotland.